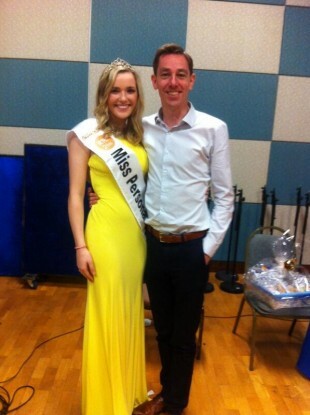 Miss GAA Laura McCormack with Ryan Tubridy. THE WINNER OF 2FM’s much criticised Miss Personality contest has been announced. And it’s…. Miss GAA, Laura McCormack! The Tubridy Show contest, the winner of which would go on to compete in Miss Ireland, came under fire when it was announced last week with the caveat “it doesn’t matter what you look like”. However, the rules stipulated that the winner would be subject to the rigours of the Miss Ireland judging process, which includes a beach segment and a swimwear competition. Contestants were not identified, giving themselves alternative titles like ‘Miss Bucket List’, ‘Miss GAA’ and ‘Miss Grecian Feline’. Listeners to the Tubridy Show were invited to vote for their favourite based on personality after listening to the women’s radio interviews. The winner was chosen based solely on listener votes. Laura McCormack won with 27.8 per cent. She’ll now go on to compete in the final of Miss Ireland in July. Laura is the first girl to be solely judged on personality, wit and intelligence rather than any assessment of physical beauty to ever enter as a Miss Ireland finalist in the 67 year history of the pageant. Email “(Somewhat ironic) photos of the winner of 2FM's 'Miss Personality' contest ”. Feedback on “(Somewhat ironic) photos of the winner of 2FM's 'Miss Personality' contest ”.